Aix-en-Provence, rare 18th century bastide facing south on a large terrace shaded by century-old chestnut trees. Beautifully restored in a chic and contemporary spirit, located in a dominant position with a magnificent view of the Sainte Victoire and the countryside Pinchinats, the bastide comprises on the ground floor a triple reception large kitchen meals, upstairs 1 master suite with office and double dressing room and 1 second bedroom bathroom 2nd floor 4 bedrooms and bathroom. 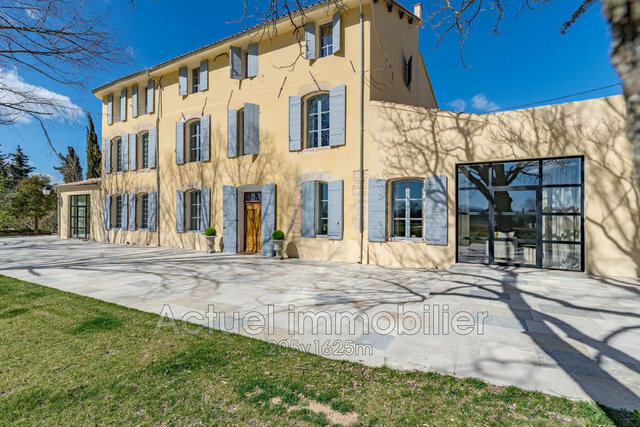 all on a walled park of 7400 m2 with swimming pool, pool-house, sports hall summer kitchen large garage for 4 cars on the back of the property 2 studios and 1 T2 / 3 can be used either for rental and for a caretaker's accommodation.